Charter members including English expatriates Alfred Edwards and Herbert Kilpin founded Milan Foot-Ball and Cricket Club in December 1899. Edwards, a former British vice-consul in Milan, became the club’s first elected president. Kilpin, who had earlier become the first-ever Englishman to play abroad when he represented Torino, was player-manager and also designated club captain, but delegated the honour to his older team-mate David Allison for their first season. The club retained the English spelling of the city’s name in honour of its origins, even when they became Associazione Calcio, rather than adopting the Italian spelling Milano. Milan won its first three League titles under Kilpin’s management. After they moved to their present San Siro stadium in 1926, two more Englishmen, Herbert Burgess and William Garbutt, managed the club before the Second World War. A number of British players have represented the Rossoneri in the post-War era, starting with Jimmy Greaves, who had a brief, unhappy spell in the early 60s. He was followed in the 1980s by Scottish centre-forward Joe Jordan and England’s Luther Blissett, Mark Hateley and Ray Wilkins; the latter two are regarded as the most successful. Though David Beckham had loan spells with AC Milan in 2009 and 2010, none of the modern British imports are remembered as fondly as Edwards and Kilpin, the club’s founding fathers. Kilpin died in Italy at the age of 46, on 22 October 1916. His grave, believed to have been lost, was identified in the 1990s by Luigi la Rocca, an amateur historian. 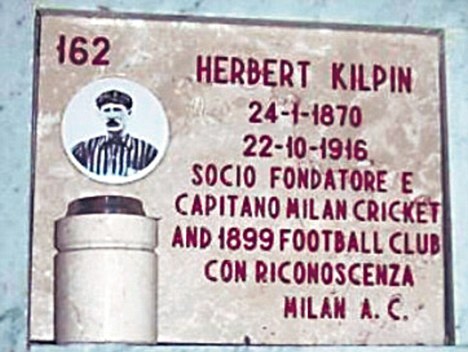 Kilpin had been buried in an unmarked grave in Milan’s Municipal Cemetery, but in the club’s centenary year of 1999, AC Milan arranged for a new tombstone in the Monumental Graveyard. Eleven years later, on 2 November 2010, in response to a petition, Kilpin was inducted into the Famedio, the main building of the graveyard, alongside the tombs of the city’s most prominent personalities.